Apptium’s EPortal™ Business Management Platform is a next generation business solution and integration platform. Based on the leading Web 2.0 Technologies it is designed to truly support the way businesses operate, finally bringing the worlds of business and IT together. APPTIUM’s EPortal™ Business Management Platform (BMP) consists of the EPortal Studio, a design time platform and the EPortal Runtime that includes a BPMN 2.0 compatible execution module. EPortal Studio is a visual and intuitive drag-and-drop development environment that you use to build standards-based web applications. The EPortal installation is a web application that is accessible via a web browser by architects, UX engineers and developers to develop enterprise applications. EPortal Runtime is a runtime server and client framework that is embedded in the application created by the Studio. You deploy EPortal applications using standard Java WAR files that can run in any J2EE container (or J2EE server). Applications built with EPortal use standard web technologies that provide scalability, performance, and portability. APPTIUM’s EPortal BMP is a next generation Business Management Platform designed to adapt to rapidly changing business environments by bridging the IT and business teams together through an agile solution offering. The EPortal BMP is a comprehensive offering which supports agile development methodologies by promoting reuse and automatic code generation of core application components like security, API stubs, data binding from the presentation to the API tier, data access layers for a variety of relational and NoSQL databases and only requiring the development teams to focus on the business integration and processing logic. EPortal BMP comes packaged with a rich set of templates that include web pages, resource class models, relationship and business processes that can easily be imported and customized to a business solution. 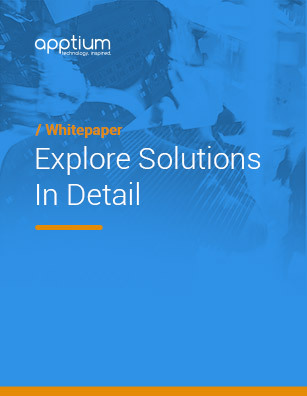 The templates are a product of years of implementation experience in the Customer Journey space and address the many challenges in the Service Provider industry. EPortal BMP is designed to help business align business processes with their goals, while facilitating process improvement by providing deep dive visibility into process metrics and real-time business metrics. EPortal BMP allows development managers and developers to rapidly model and integrate their application components, while ensuring that existing assets are leveraged. A Dynamic Technology Platform enabling delivery of superior customer experiences by unifying enterprise systems and guiding users both internal and external to the enterprise, through business processes across channels, interaction points, and geographies. An agile development ecosystem for rapid development of standards-based Web applications. Customers use it to rapidly deploy applications such as Customer Active Desktop (CAD), Order Entry, Order Management, Self Serve, Service Assurance and Troubleshooting Portal and to drive extensibility by integration to existing enterprise systems. Used to create Rich Internet Applications that provide fast, accurate, consistent information across all channels, EPortal provides the ability to capture, track, assign, and manage customer requests, from initial contact through resolution across all channels, including social media.